Villa Yayla is a stunning, brand new luxury two bedroom luxury villa in Kalkan. It's a truly breath-taking villa in Turkey. Villa Yayla is perfect for small group, family or honeymoon couple. Villa Yayla is a stunning, brand new luxury two bedroom luxury villa in Kalkan. It's a truly breath-taking villa in Turkey. Villa Yayla is perfect for small group, family or honeymoon couple, offering every comfort you could want from your holiday. Situated in a quite location in the hills behind Kalkan, it's the perfect place to switch off and relax the days away. The villa is fully air conditioned, and has beautiful cool marble flooring throughout. Villa Yayla looks modern, contemporary and features stunning seaviews. The villa has an amazing pool, amazing sea views and is 5 to 10 minutes drive to Kalkan and the beach. 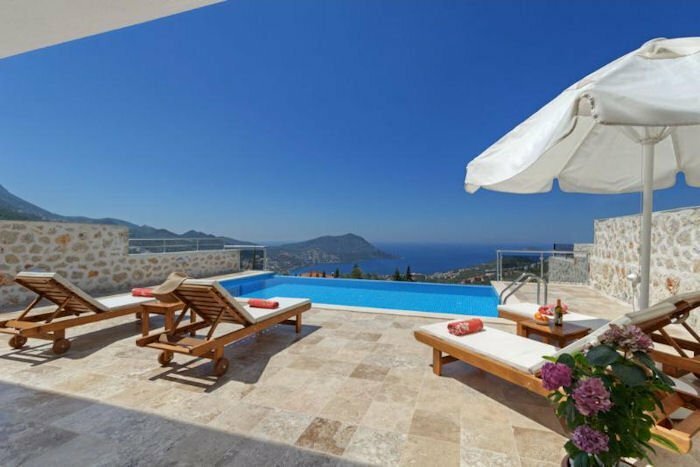 Being in such an elevated position means the view from the villa are truly breath-taking the whole of Kalkan is laid out before you with distant views towards Kalkan Harbour. There is a spacious, marble patio area surrounding the beautiful infinity pool, pool terrace, with plenty of sunbeds and umbrellas, BBQ and dining seats. Private parking is available outside the property. There is a huge lounge area. There are comfortable seating, sofas, armchair and coffee table, large HD flat screen TV with satellite TV and DVD player. There's also WiFi internet access. Open plan fully equipped kitchen, fridge, fridge freezer, microwave, oven, kettle and toaster etc. There is a cloak room as well in the lounge area. Bedroom 1: With king size bed; en-suite bathroom with shower, wardrobe and wall to wall French windows with gorgeous sea views. Kalkan has a small but pleasant beach only a few minutes' walk from Villa Yayla. Or, on the Western side of Kalkan, is Kalamar beach, which has a beach club and a couple of waterside restaurants to choose from. Stroll down the hill to the water's edge and you will find the small but beautiful marina where you can catch a boat to take you for an amazing day out at sea, or indulge in a choice of water sports from the beach club.